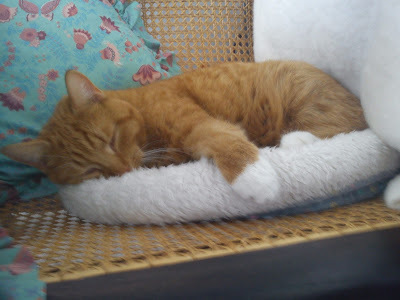 Why do you always have to take pictures of me, when I am sleeping, human ? 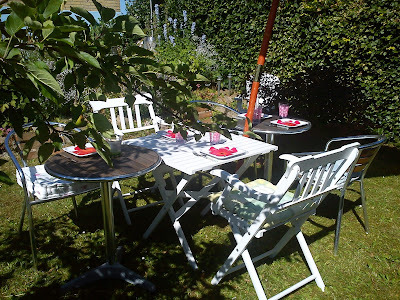 What an amazing number of page views - 75.000 page views - into to life here in my little kitchen and even smaller garden/park and tiny kitchen garden. Friends keep asking me, why do you actually blog ? 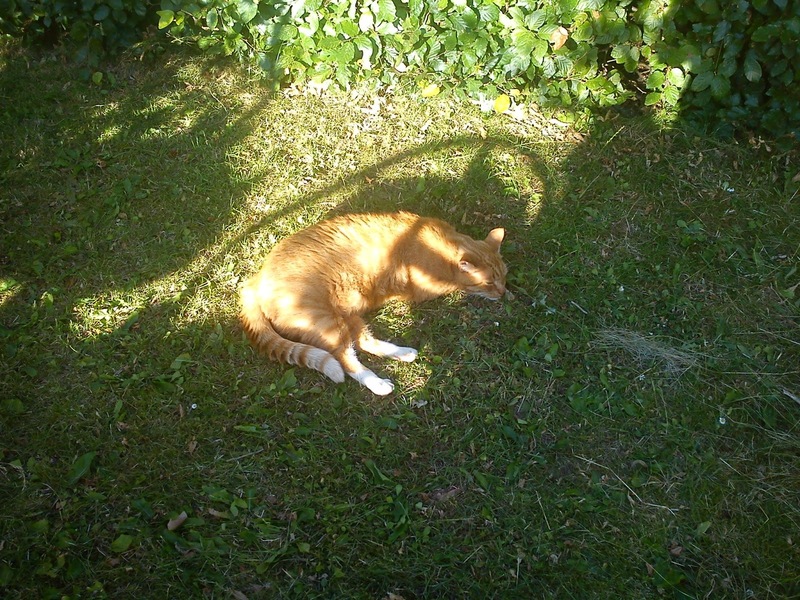 For me it is a way to stress off from work just like gardening, as you actually here can see, that something is happering like, when you are working in your garden. 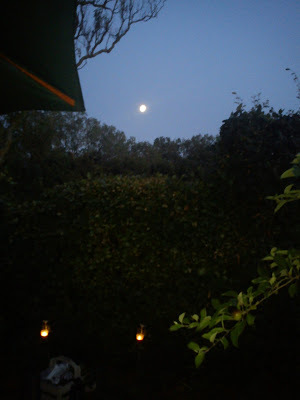 The trick for me is to say, when I have spend a certain amount of time in my garden or blogging, when it is more than OK to stop, letting everything rest and do something else or nothing at all, if you feel like this. 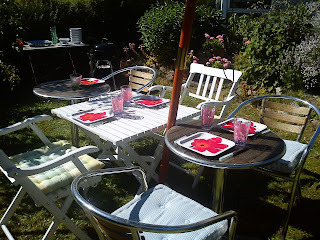 Within another short periode of time of only 7 months my blog about activities in my kitchen and garden has been having another 25.000 page views, so it has reached a new mile stone of 75.000 page view since the very beginning a little closer to 3 years ago. Three blog posts, which have been written here in 2013 have actually made it into the overall Top 10 list, which is quiet amazing. The most amazing is actually the post on "Paleo (Stone-age diet) chocolate", which made into the overall Top 10 (being a number 7) within a time frame of 1 week !!!! 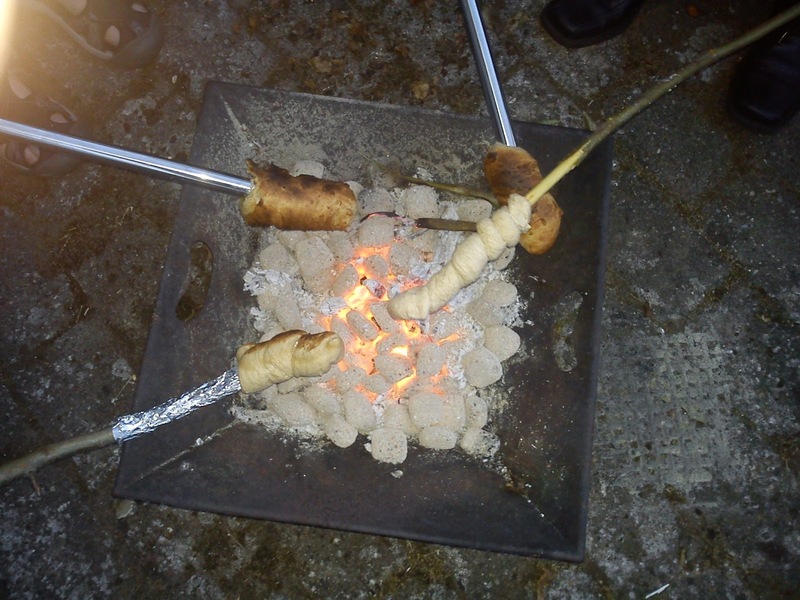 So a bunch of Stone-age people must have made it into the virtual world - welcome :-) The two post from 2013 on the overall Top 10 list is "The ultimate strawberry cake - Strawberry cake version 5.0" and paleo related post "Stone-age bread". I have also noticed, that I have more and more readers coming from out-side Denmark, where USA, Russia, UK, Germany and Norway still accounts for the growth in non-Danish readers. OK - are you happy now human ? 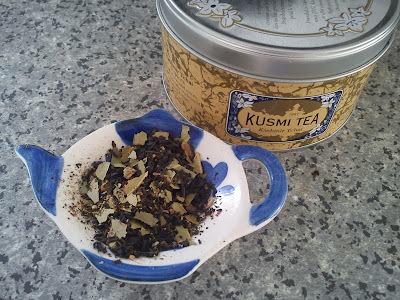 Kusmi tea is my favourite tea brand for several reasons. Yes as starting point I will admit, that I like the tea tins, but it does not "hurt" the tea to be "dressed" up in a good-looking tea tin !!! But the most important reasons are, that all the Kusmi tea looks great and taste wonderful :-))) I will also admit, that the Kusmi teas do cost a substantial amount of money, but here the tricks are either to but them, when your local tea pusher are having them on offer due to the tea being close to end of shelf-life OR to buy the teas in France, where they are cheaper compared to the price level here in Denmark. And in some of the Kusmi tea shops in Paris you can actually buy your favourite tea in loose weight, so only the tea without any tea tin, which also is costing less money. Well back to basic !!!! I really like both the nice look and the fantastic spicy tea taste of Kashmir Tchai, which is a blend of tea and spices according to the traditional Nepalese recipe. As spices there is used ginger, cinnamon, bay leaves, anise and cloves. I found this recipe on Greek yogurt served together with rhubarb compote and honey roasted muesli in the weekly magazine Femina (issue 27/2013). And it looked like a perfect start to a lazy Sunday breakfast or a lovely brunch together with friends and family. It is not the last time, that I spend the time on making this rhubarb compote or the honey roasted muesli, as they really are the key ingredients to serving this yogurt. 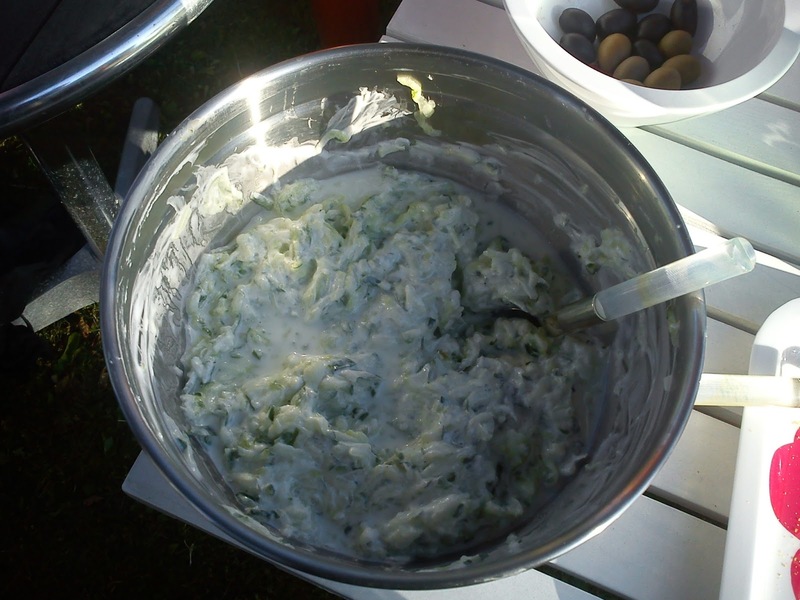 I decided to use Greek yogurt with 10% fat, as I like the creaminess of such a product, however, use a yogurt with what ever fat content you have a prefer for. And you also use any type of yogurt, which you have in your refrigerator to make this brunch dish. If you are serving more dishes for the brunch table you can easily reduce the yogurt amount to less, as it is a quiet filling dish. 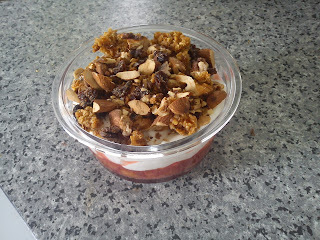 Finish of with addition of the honey roasted muesli. This is another key ingredients to Greek yogurt with rhubarb compote and honey roasted muesli, where I found the recipe in the weekly magazine Femina (issue 27/2013). 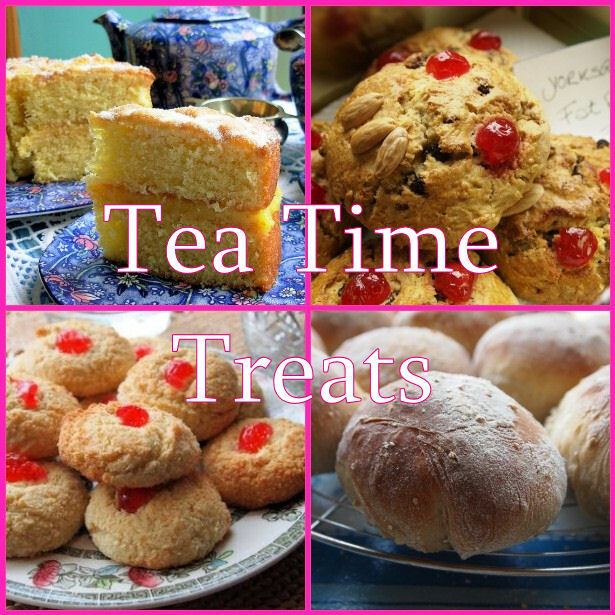 I have made several changes to the original magazine recipe, as I wanted to use various ingredients available in my kitchen instead buying similar ingredients. The changes are: walnuts have replaced hazel nuts, as I dislike hazel nuts. 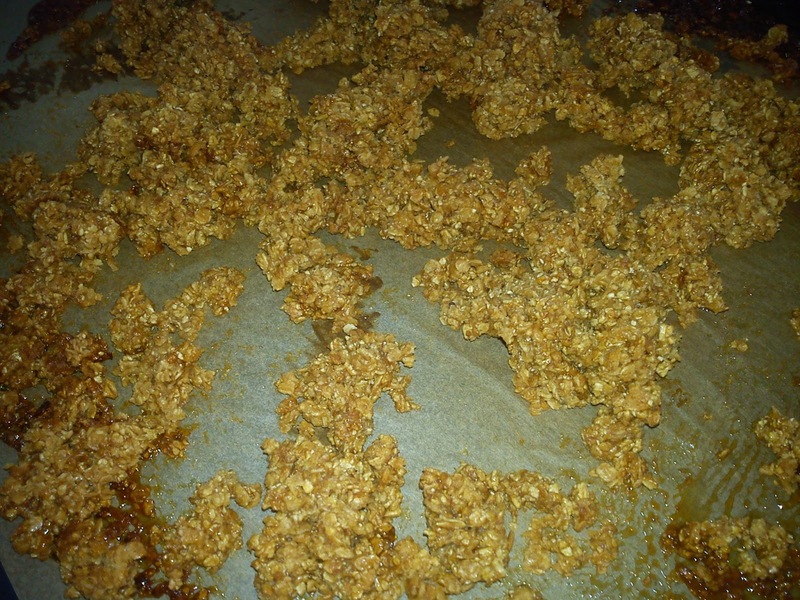 The coarsed rolled oat flakes was replaced by a combination of finely rolled oat flakes and barley flakes. And as I "ran out of" liquid honey I used a mix of liquid honey and dark sugar syrup. Roast the almond and walnuts together in an oven (conventional) in the upper part of the oven at 200'C for 10 minutes. Cold down the nuts and chop them roughly afterwards. 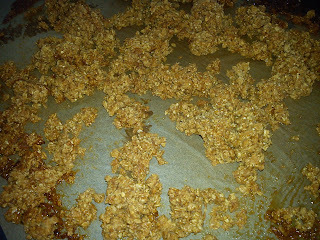 Mix oat flakes, barley flakes and salt together on a baking tray covered with baking paper. Pour honey and sugar syrup over the flakes, and mix everything together. 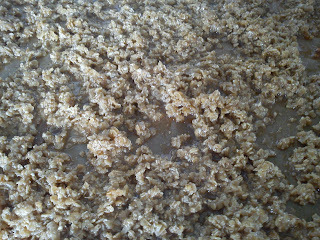 Roast the flakes in the oven (conventional) in the upper part of the oven at 200'C for 15 minutes. After every 5 minutes takes the flakes out of the oven and turn them around. After 15 minutes at 200'C reduce the heat to 100'C and roast for another 10 minutes. Continue to turn the flakes around every 5 minutes. 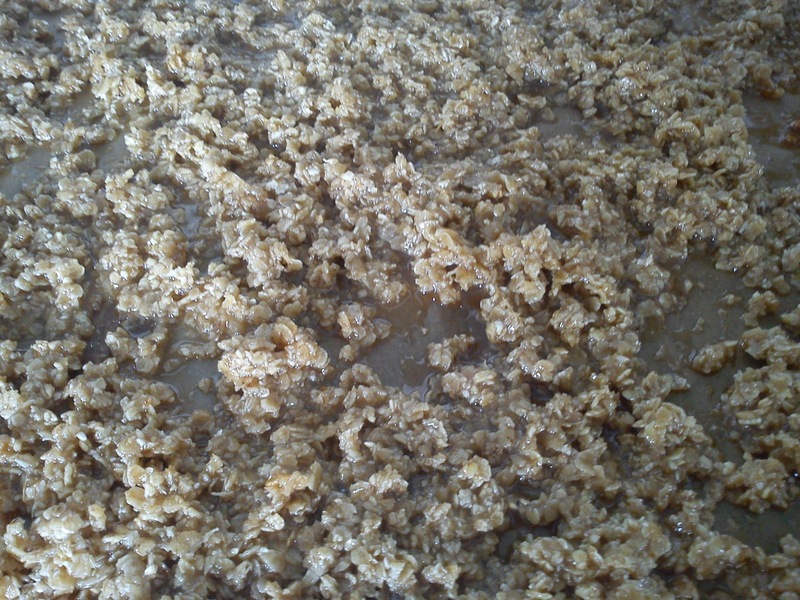 Let the oat and barley flakes cold down. 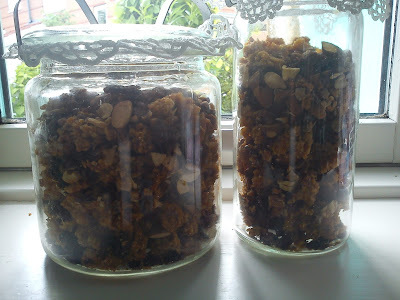 Mix the roasted nuts and honey roasted oat and barley flakes together with raisins. In the weekly magazine Femina (issue 27/2013) I found this recipe on rhubarb compote, which is playing a major role in making this fantastic start on a lazy Sunday breakfast. The rhubarb compote is bringing sweetness and great acidity to Greek yogurt with 10% fat topped of with home-made honey roasted muesli. 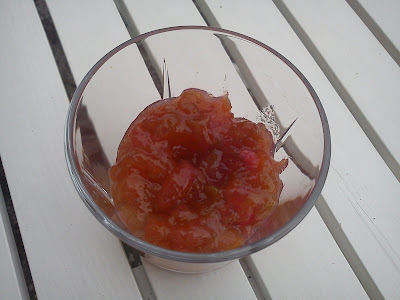 I have made no changes to this recipe on rhubarb compote. Add rhubarb pieces, sugar, vanilla corns and vanilla pod into a small cooking pot. 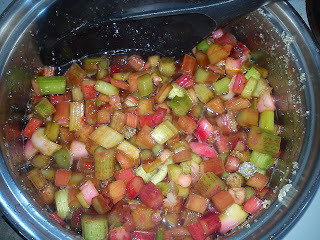 I also added some water, as the fresh rhubarb pieces did not give a lot off a lot of water themselves. Gently heat up this rhubarb mix to the boiling point. Cook for 10-15 minutes until the rhubarb pieces are soft, but still mainly most of their sharp. Prepare the storage glasses by filling them with boiling water. I do not use any preservatives in my home-made compote nor jam, so this is important to increase shelf-life of your compote. 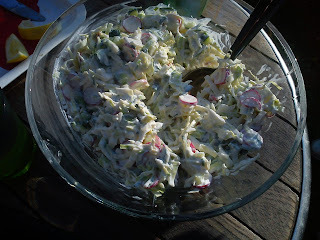 Fill the rhubarb into the glasses and store them cold in the refrigerator afterwards. 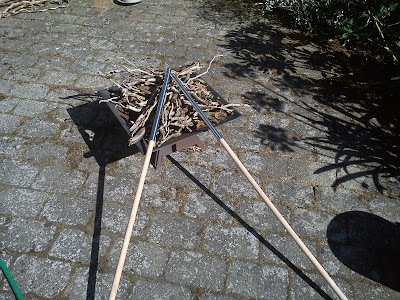 I hardly dare to write about my lasts edition of new kitchen equipment in form of sticks for twist bread baking out here in the virtual world !!!! 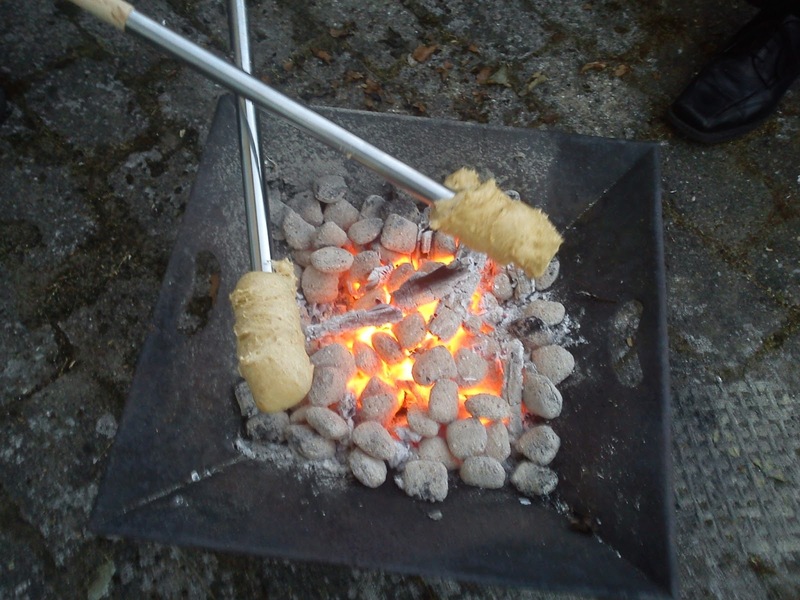 I found these sticks for twist bread in my local supermarket, where they costed 45 DKK/stick (approx 6 €), and they have some sort of metallic fitting at the end, where you place/twist the dough around, before baking/burning the twist bread over gloving tree/barbecue charcoals. The good thing about using these sticks are, that you first of all get a bigger hole in the twist bread, which you can fill with various of fillings. And the second thing is, that you have no need to cover a branch with tin foil to have a clean hygienic place to twist your bread dough. So why do I hardly dare to mentioned the latest addition to my many types of kitchen equipment ? According to the "hard liner" within "traditional" twist bread bakers (no names mentioned, but my good friends in Horsens are such "hard liners" :-) ) those sticks for baking of twist bread is neither sustainable (one of today´s many "buzz word") nor authentic feature for a "old time" thing as baking twist bread. Well - I like my twist bread sticks !!!! 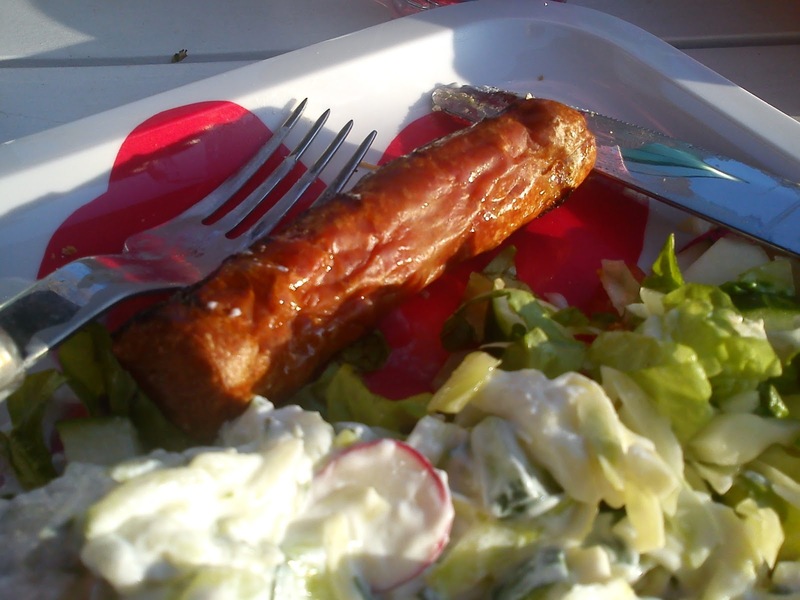 And I very sure, that the good friends participating in this barbecue evening were quiet happy with your decision. 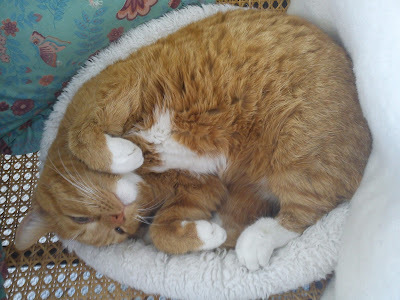 A big thank you to all of you, who decided to play along with on this blog voting. For baking these twist bread I have again some time ago brought some fancy twist bread stick with stainless steal for placement of the dough. Some of my guests were very unhappy about using such a new innovative kitchen equipment, as this was breaking their dream about "the good old days", when they used branches for baking twist bread, so some of my guests went looking for fresh branches, as they wanted to make their twist bread in real retro style !!! 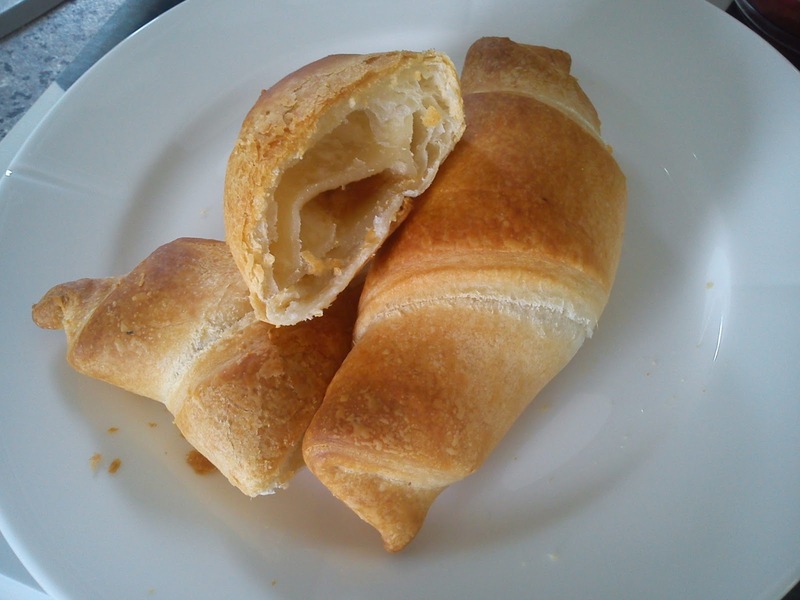 However, the "retro" bakers soon discovered, that a branch is giving a much smaller hole in the baked twist bread. And in this hole you can fill dark chocolate, strawberry jam, Nutella or Belgian nutella, which turned to be something of a hit. A little remark to the recipe, I decided to reduce the amount of yeast for half the amount, as the dough had to stand for 5-6 hours, when the baking/burning process took place, and the temperature was quiet high. The taste of marzipan is not very noticeable in this recipe, so the marzipan seems only to give sweetness into the twist bread. The question is, how much sweetness do you in a bread, which you will filling with plenty of sweetness in form of jam or Nutella ? So my recommendation is to save your money from removing the marzipan and use 1-2 tablespoons of sugar instead of. Add yeast and water into a mixing bowl and stir well. Afterwards add oil, salt, grated marzipan and flour. Knead the dough well together, I kneaded for 5 minutes. Place the dough in the mixing bowl, cover the bowl with a lid and let the dough rest for 2-6 hours as room temperature, until it is time for baking the twist bread. Divide the dough into 6-8 portion, and roll each piece into a long piece, which when is twisted around a stick. Fill the hole in the twist bread with jam, Nutella or chocolate. 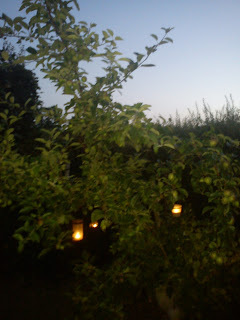 Yesterday evening a group of great friends meet in my little garden for the annual illumination evening in my little park. While the starter was prepared by my cousin, we started the barbecue evening with a cocktail called Apple Mac, where I have got the recipe from this year´s Summer TV with Anne & Anders. 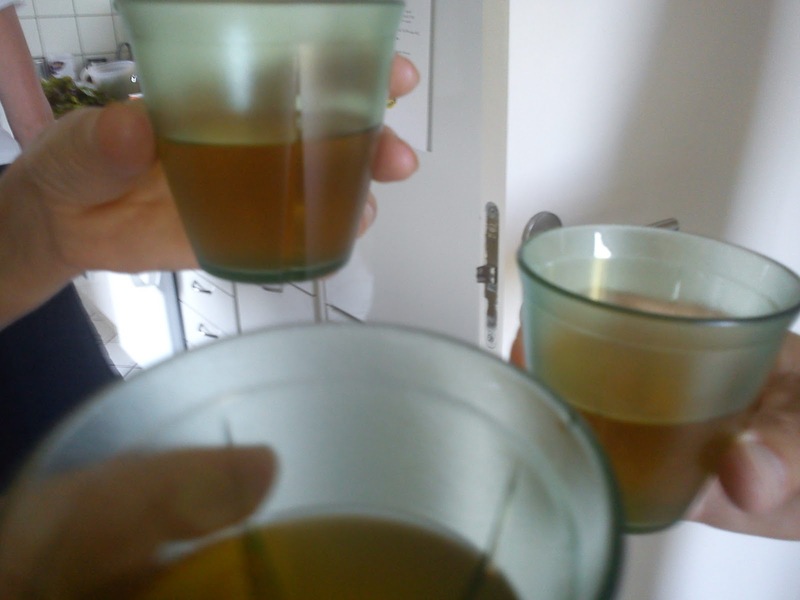 We started by tasting the original recipe, and the majority decided it was to dominated of alcohol, so the amount of apple juice was increased. I will later share this adjusted recipe with you. As starter we got a mix of olives, where all the stones afterwards were frown around in my little garden, so lets see, if I have an olive grove in 20 years time. 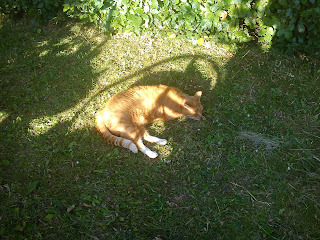 As usual Hannibal the Cat was curious about, what was going on, so he took a little nap on the grass next to the tables. 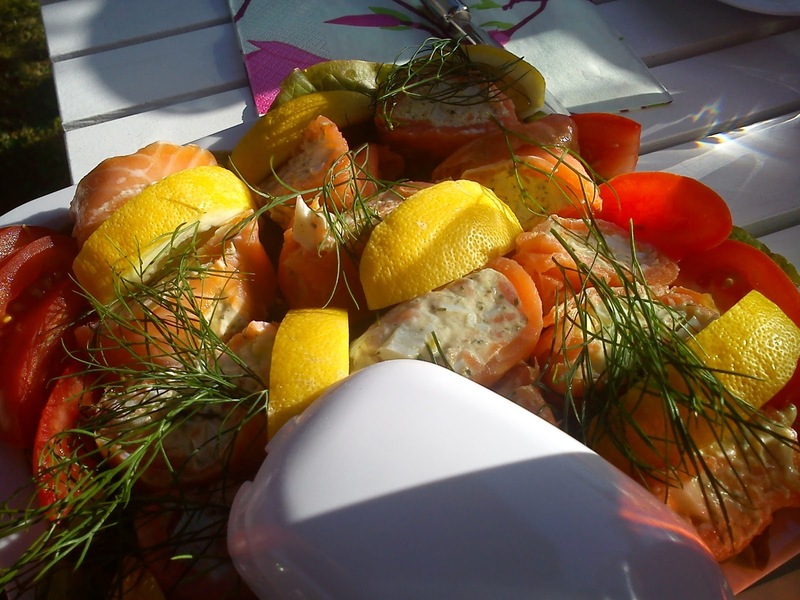 As the "real" starter we got salmon slices rolled around a filling of cheese, fromage frais & dill served together with salad leafs, tomatoes, lemons and bread. A good start for the rest of the evening. freshly dug up potatoes from the garden of my friends in Horsens. 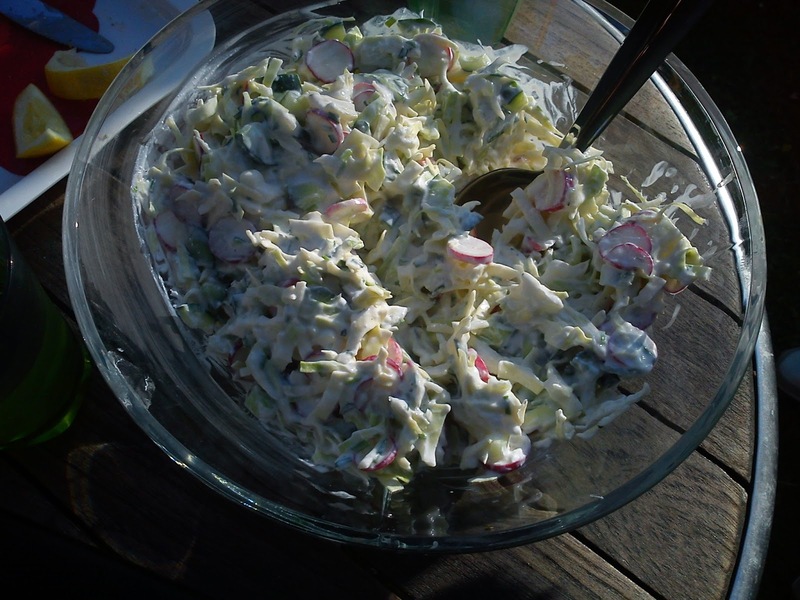 cold slaw made from pointed cabbage, cucumber, radish, Greek yogurt and traditional Danish smoked cheese (rygeost). As the finishing dish I have made dough ready for baking of twist bread, which we should bake over a fire bowl using some fancy twist bread stick with stainless steal for placement of the dough. 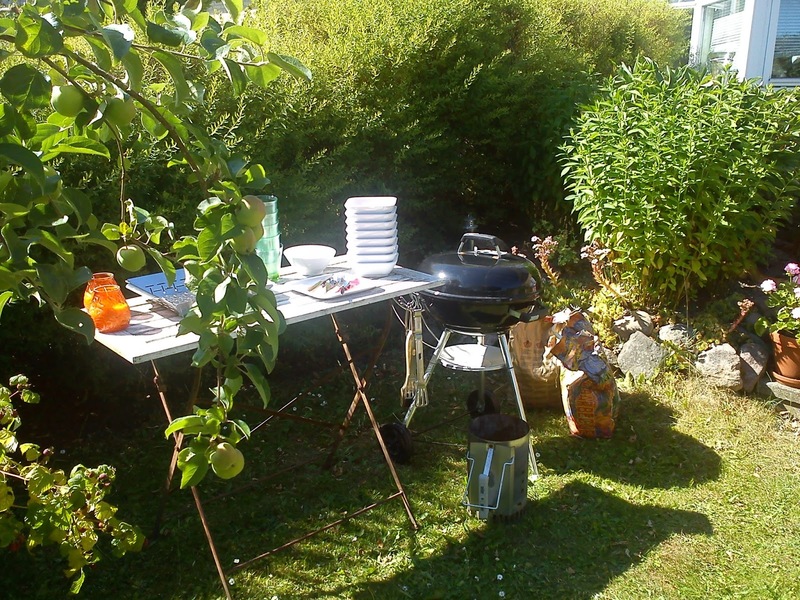 It was almost before a "revolution" was breaking out in garden over the use of such fancy "kitchen equipment" among the guests. So some of the guests went looking for the fresh branches, as they wanted to make their twist bread in real retro style !!! 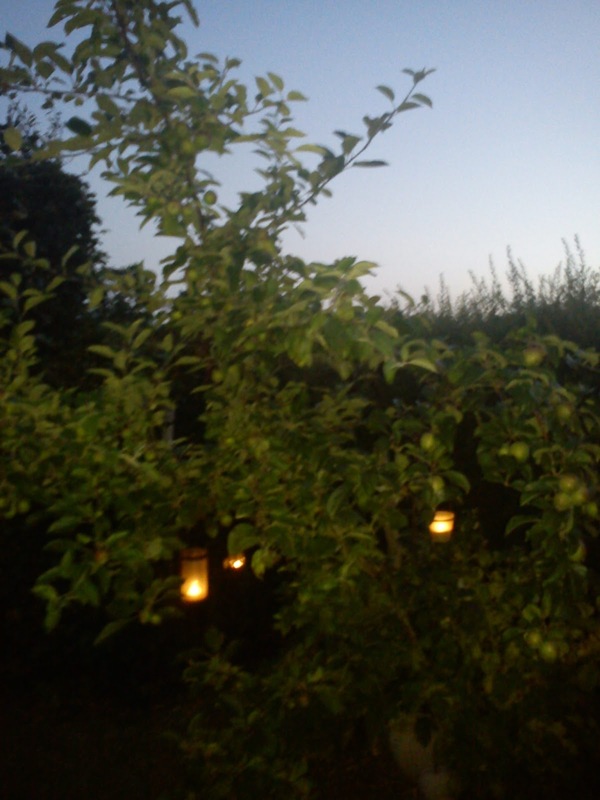 While we were baking twist bread we could enjoy the illumination with tea lights of my garden. Sitting by a open fire has similar relaxing power as water for your busy mind. Even though that the guests had to bring the food for this barbecue evening, they also brought some amazing hostess gifts. 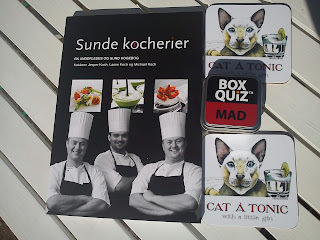 My cousin gave me a new cooking book called "Sunde kocherier", which I am looking forward to test out in kitchen. 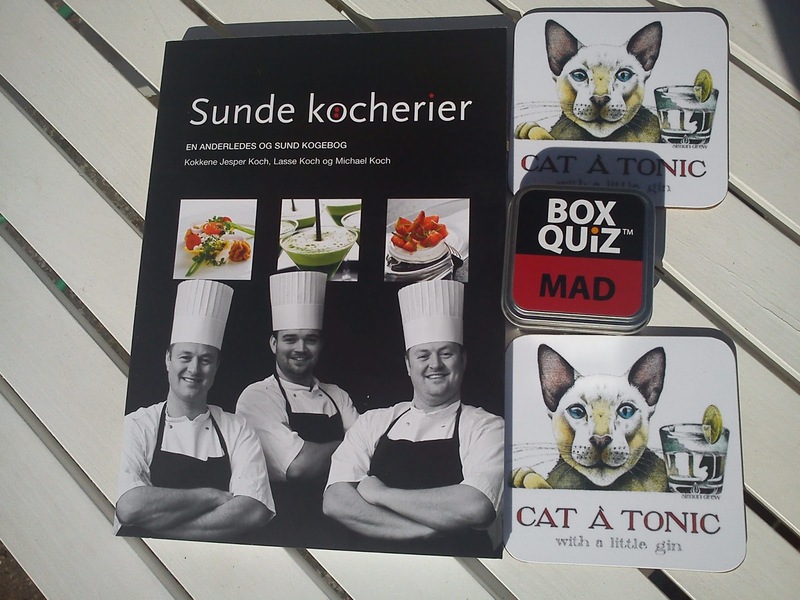 My very good girl friend knows me to well, so she had found a small game called Box Quiz with the topic of food !!! She wisely enough decided not to choose the quiz with focus on cheese, as this would give me and other friends too big an advantages due to our educational back ground. Cheers for a great evening with very good food and some fantastic company of some great friends :-) You are all invited back for a new illumination evening in 2014. 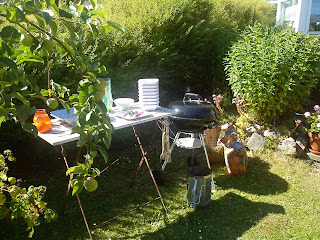 As usual I am responsible for the grill, the drinkables and dessert. The participating friends will be bringing the rest including their good mood !!! This is a very nice way of entertaining friends = please come and visit me, but please bring the food with you !!!! I am sure, that the guests of this evening are happy with your decision. I will be sharing photos of the food, which the guests are bringing with them tomorrow. 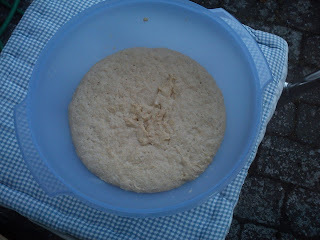 And now I better get starting on making the twist bread dough with marzipan. A bottle of liquid gold ? After I finally cracked the code on how NOT to make a bitter tasting elder flower aquavita, I continued on task to make elder flower liqueur, which should taste of Danish Summer. 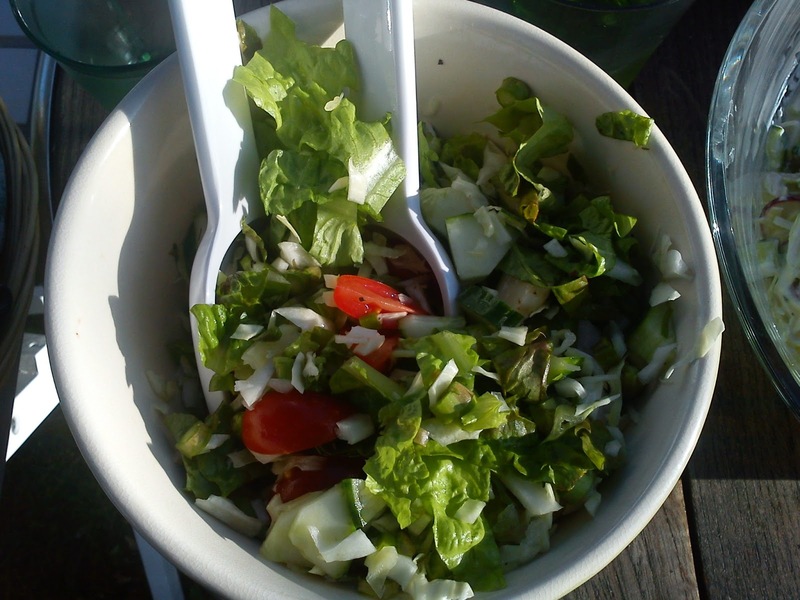 Again I used this recipe on hyldeblomst likør as starting point. I must admit, that it feels a little bite like Christmas, where you have to wait for almost one month, before you can finally open your Christmas presents. I have exactly the same feeling about, when I an going to taste the very first drop of elder flower liqueur in one month time. 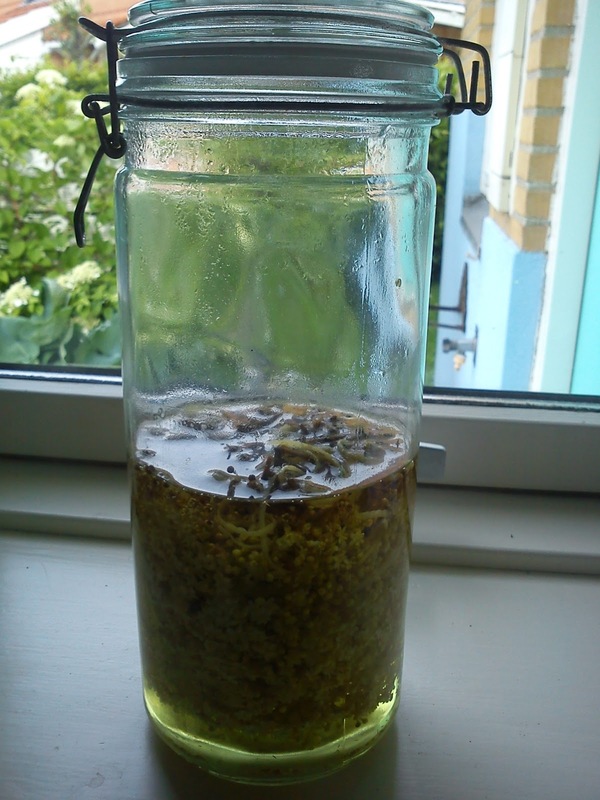 Anyway let´s get back to business and let me share the recipe on my version of elder flower liqueur with you. Start by sterilising the bottle with boiling water. Add the honey, lemon zest and elder flower aquavita into the bottle. Store the bottle in a dark place and shake it from time to time. Let the lemon zest infuse the elder flower liqueur for one month, before you remove it by passing the liqueur through a funnel covered with coffee filter paper. Pour the elder flower liqueur into a new sterilised bottle. Consider to add more honey, if you would a more sweet liqueur. The elder flower season of 2013 has been playing some tricks with me :-) First my elder flower tea failure version turned in yeasty one big lump followed secondly by an elder flower liqueur failure version, which was extremely bitter !!!! And here positive minded persons will not see problems, but opportunities for developments and success !!!! So I took on my "ja-hat" (= yes hat) as we say here in Denmark and went looking for elder flower liqueur recipes with google. And I found various suggestions each for them going in many different directions. 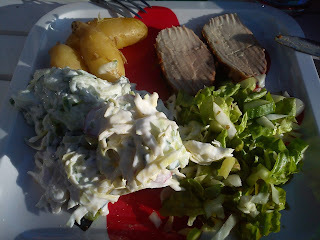 I decided to place my trust in these two recipes hyldeblomst snaps and hyldeblomst likør. I also learn, that the reason, why the elder flower are changing colour from cream white to brownish black is relating to oxidation. Interesting to notice, that this oxidation takes place in alcohol, but not in vinegar, as the elder flowers in this elder flower vinegar maintain their wonderful cream white colour !!! 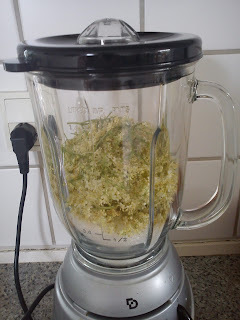 It should be possible to avoid the bitterness doing these two things: removes as most of the stems as possible, which I spend 1 hour doing in front of the TV, and only let the elder flower remain for 4 fours submerged into the alcohol. 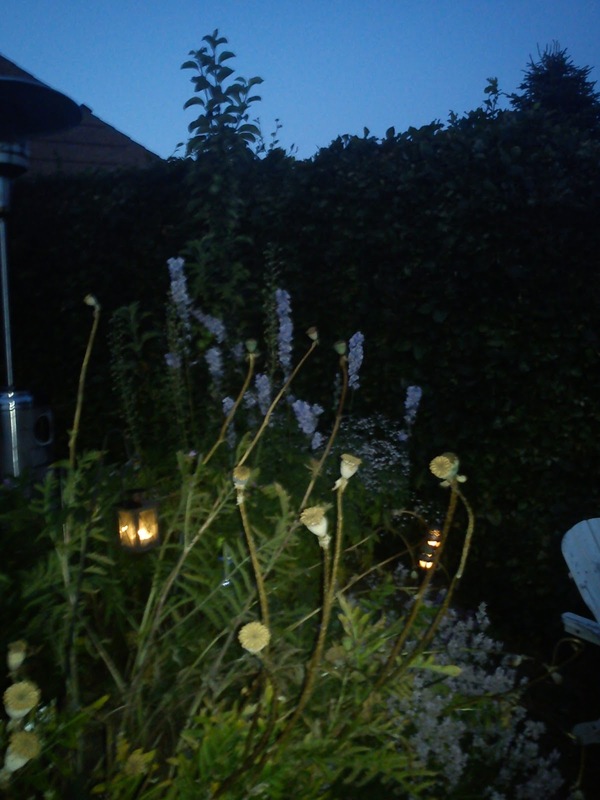 When I removed the elder flowers from the vodka I took a tiny, tiny snip of the vodka and it tasted like a wonderful Danish Summer day or perhaps just like heaven. Start by removing the flower heads from the elder flower stems, this is quiet time consuming, so place yourself in front of the TV. Fill the flower head in a glass, which was sterilise by boiling water beforehand. Fill the vodka on top. 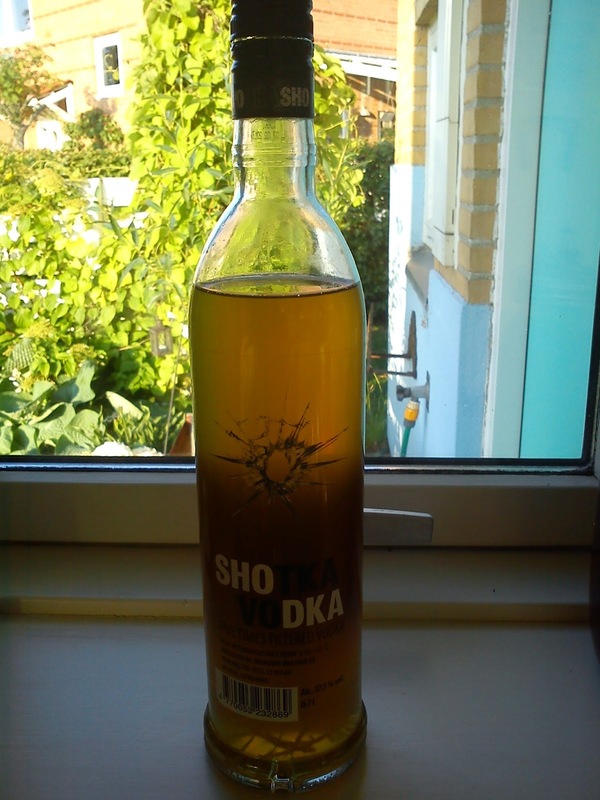 Place the glass in the refrigerator and let the elder flower infuse the vodka for 4 days and not a single day longer. Remove the elder flowers from the vodka. Pass the elder flower aquavita through a funnel covered with coffee filter paper in order to remove any elder flower leftovers. You now have a great tasting aquavita or an important building stone for making elder flower liqueur. After my BIG disaster making this first version of elder flower tea, which turned into one big lump of loose tea leafs combined with some yeasty look-a-likes, I decided this was a development area of mine, where I could develop new competencies !!! 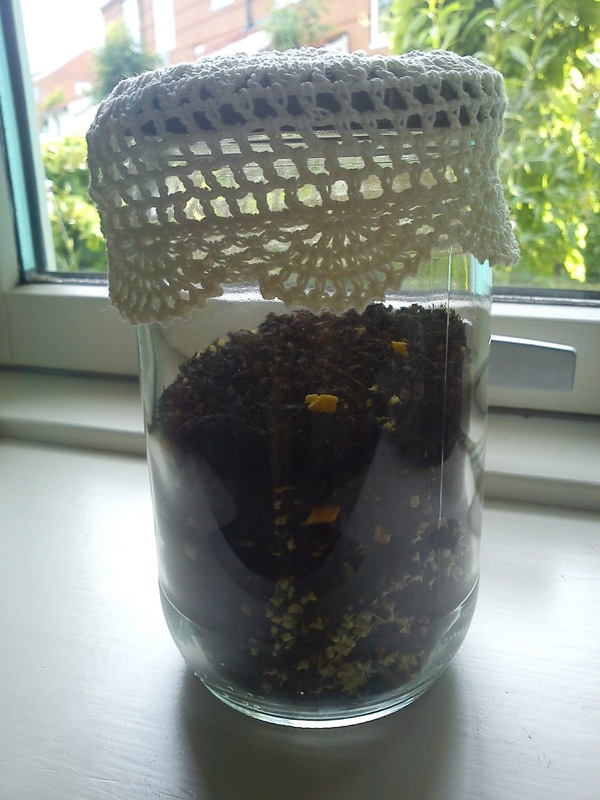 Such as making an elder flower tea maintaining it´s structure of loose tea leafs and without yeast. So please cross your fingers out there behind your laptops for a successful outcome on this way of making elder flower tea. I am really hooked on this idea of making an elder flower, as both the sight and taste of elder flower for me is a true sign of Danish Summer. By the way you can also participate in an on-going vote on this blog until Friday 19 July 17.00 CTE, if I should make twistbread with marzipan for a barbeque evening this upcoming Saturday. So it is up to you, if my guests should have dessert or not !!!! 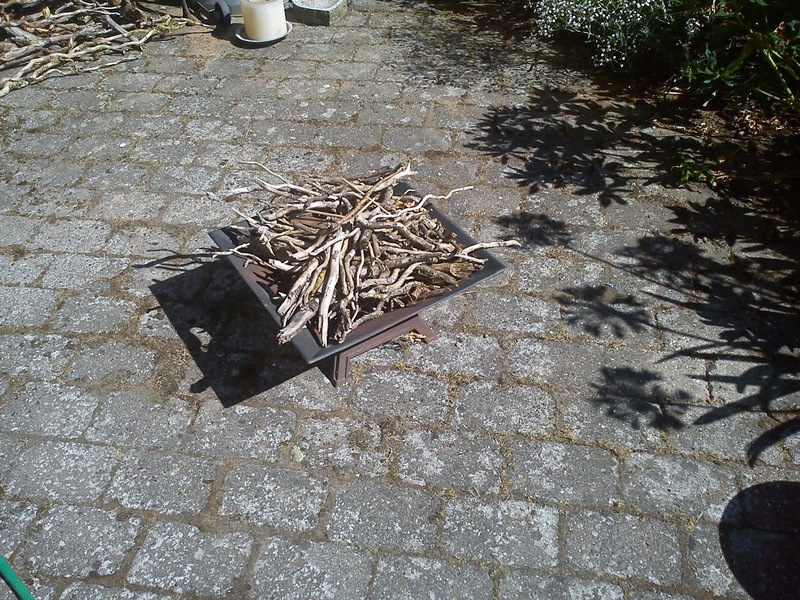 Start by removing the elder flower head from the elder flower stems, and let the flower head dry. It took me 1 day to dry these flower heads. Cut the dried lemon peel into small pieces. I used a scissor for this purpose. 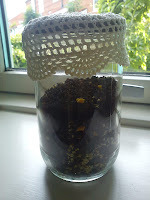 Mix the tea with the small pieces of dry lemon peel and dried flower heads. Mix everything together in glass, which is air tight. However, I have decided to enlarge the theme into vegetable as my entry is made from rhubarb, which is not a fruit, but considered to be a vegetable !!! Anyway, I am growing rhubarb in my own little garden and I have as well various friends and colleagues how are happy to supply with me rhubarb for their own surplus. Instead of making muffins with rhubarb and white chocolate or rhubarb crumble, I decided to share this recipe on rhubarb jam with vanilla for the tea table. I think this jam will do quiet nicely together with some scones. Normally I work with ratio of 1 part sugar to 2 part of fruit, when I am making jam, but as rhubarb is quiet acidic, I decided to increase the ratio between sugar and fruit to 1 part of sugar to 1 part of rhubarb. 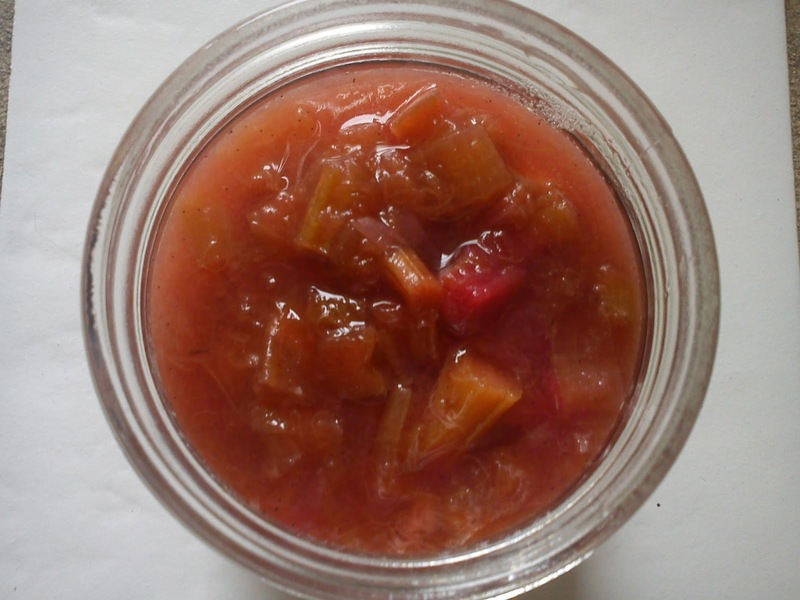 If you prefer a less sweet tasting rhubarb jam, you can always start with 1 part of sugar to 2 part of rhubarb, cook up the rhubarb, taste the hot jam and evaluate the entire sweetness of the jam, and when adjust the sweetness by adding in more sugar. I always add the remain of the vanilla pod, when cooking various things using vanilla. And I never remove the vanilla pod from my jam, so if you are the "lucky" receiver of my jam, you should be prepare to remove the vanilla pod yourself. Mix the rhubarb pieces with jam sugar, vanilla corns and pod with lemon juice in a cooking pot. I use a Gently heat up to the boiling point. Let the rhubarb jam boil for 4-5 minutes. Prepare the jam glasses by filling them with boiling water to sterilise them. 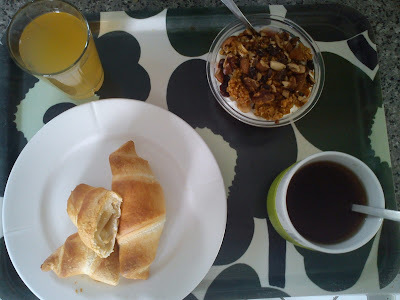 Finally a lazy Sunday, where I had no need of getting early up and eat the usual bowl of muesli with milk and drink a glass of milk, before rushing off to the rowing club for an early morning row at 7.00 o'clock !!! I also enjoyed a glass of apple juice from Løgismose with a touch of mint. 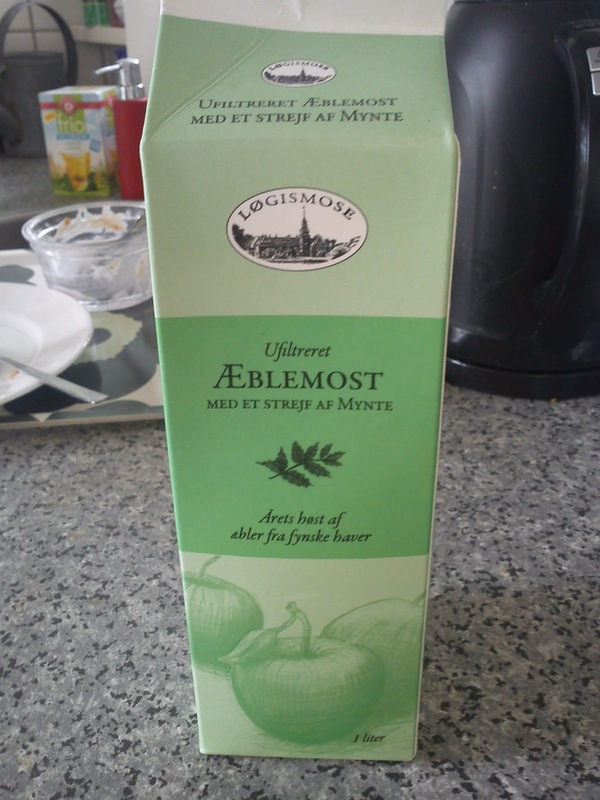 It was a good apple juice, but I could NOT detected any touch of mint anywhere in the apple juice. In my opinion you should be able to taste the ingredients, if it is high lighten on the product !!! Yes, I spend some time preparing for some part of the breakfast, and when I spend no time making croissants !!! I simply used a ready-to-bake croissant dough, which I pimped with a small tea spoon of speculoos = Belgian Nutella baked in a inner core if the croissant. 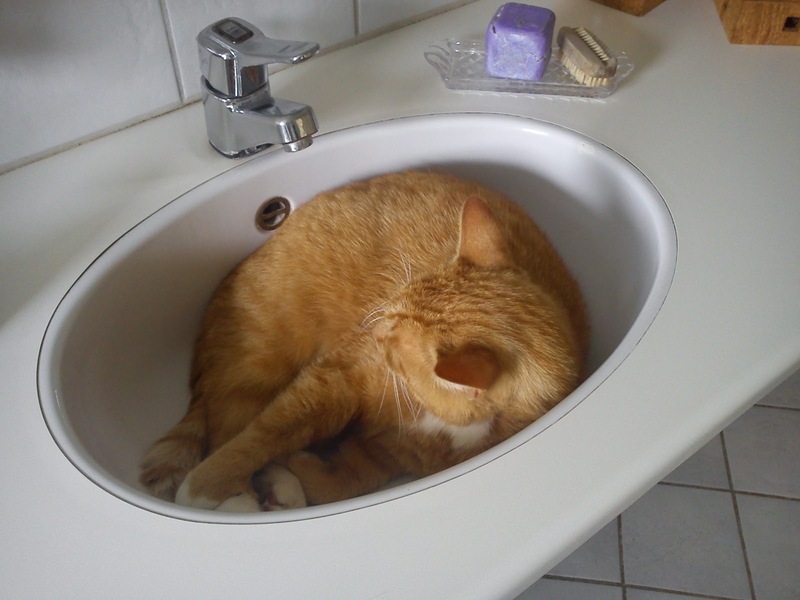 While I was enjoying breakfast in bed reading new papers (being a bit behind on Friday´s and Saturday´s local newspapers), Hannibal the Cat was taking a nap in the bathroom sink after a night out in mouse-town. I am a big fan of elder flowers, and I like to find different ways of using this wonderful flowers in my little kitchen. 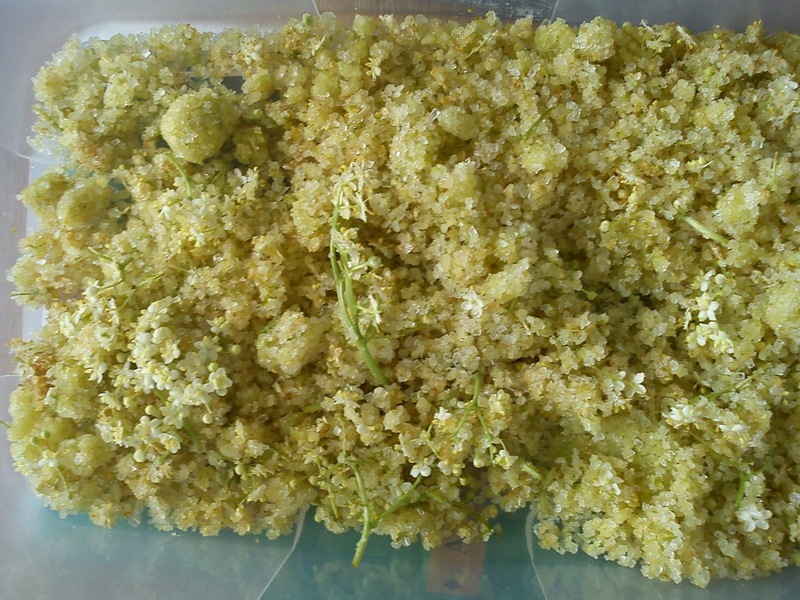 And this year I decided, that I wanted to try to make elder flower liqueur. I imaging in my mind, that elder flowers, lemon peel and vodka would be a perfect combination. In my mind it is equal important to share your all of your experience within your kitchen, so both the things, which turns about as expected and the things, where something goes wrong. Perhaps you behind your screen would be able to share your knowledge as too how, my failures can be corrected and therefore give me the expected result. Well, a long start to this elder flower liqueur, which is instead of being a wonderful Summer liqueur turned into bitter alcoholic nightmare. The elder flowers were changing the colour from cream white to a brownish black colour. 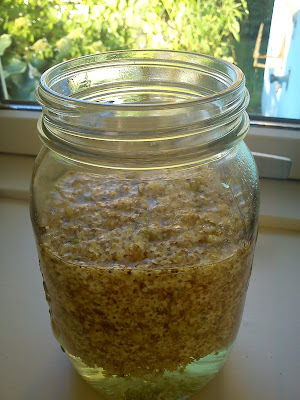 Afterwards I have reading various recipe on elder flower liqueur out here in the virtual world, so I will have another go on making this elder flower liqueur of my mind, as I still can find elder flowers here in Denmark, even though we are in the end of the elder flower season. Put the elder flowers and lemon zest into a glass. Afterwards fill vodka on top of the elder flowers. 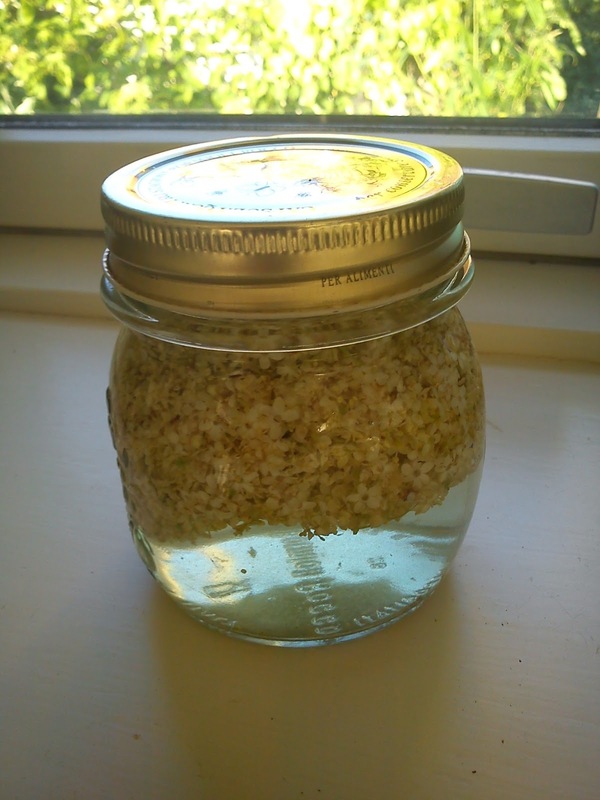 Place the elder flower vodka at room temperature for 10-14 days. Remove the elder flowers and lemon zest from the vodka. Sweeten the vodka with sugar. Most people will think beer and chocolate, when you mention Belgium and food, and so do I as well. 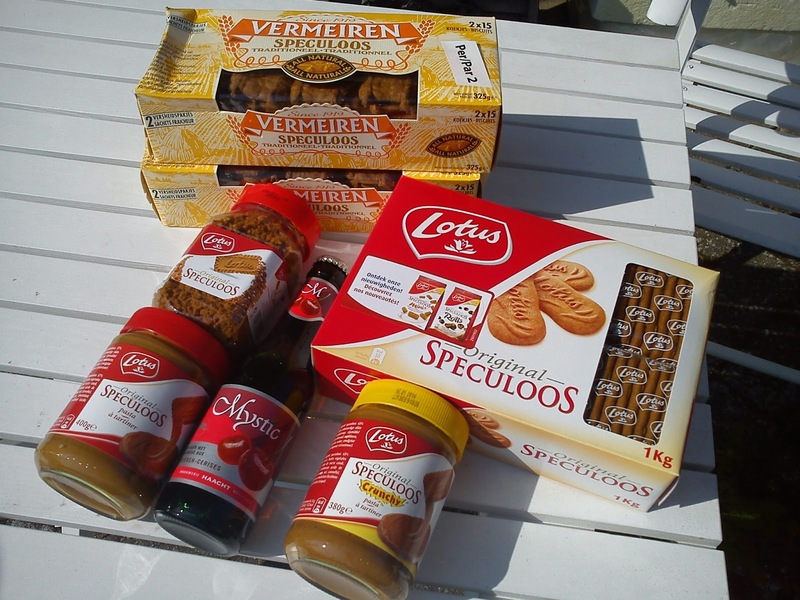 However, I have recently discovered a third specific food item from Belgium, which is Speculoos pasta à tartiner. Speculoos is a thin spiced biscuit, and the pasta à tartiner reminds me about a liquid thick biscuit dough or as I refer to it Belgian Nutella !!! 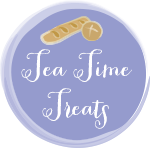 And I am crazy about the Speculoos pasta à tartiner, which is good on buns, biscuits or simply just to eat it "raw" from the glass with a spoon !!! Last week I was on a rowing tour to France and Belgium arranged by the Danish Rowing Association together with 20 other great rowers fro around Denmark. And here I grab the opportunity to buy a smaller stock of various Speculoos products (biscuits, sprinkles and pasta à tartiner) as a souvenir and bring it back with me to Denmark. Among my shopping you will also find some bottles of Kriek, which is fruit beer with 25% cherry juice. Normally I really dislike beer due to the yeasty and bitter flavour, which is characteristic for beer. But these fruit beers does not taste of beer, and on the other hand they do not taste like breezer on the other hand. They have a good balance between fruit sweetness and freshness. I have found this this recipe on elder flower vinegar on the great blog by Klidmoster, and I have no made any changes at all to her recipe. So this evening I was out walking in the neighbourhood cutting some more elder flowers for use in my little kitchen. Afterwards I spend one hour in front of the TV removing the elder flowers from the stems by hand and this process is quiet time consuming. 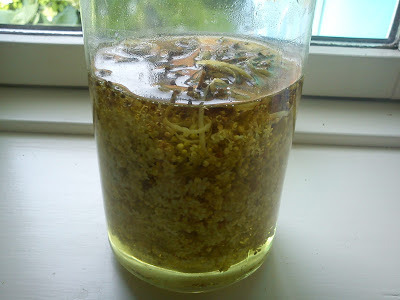 So a small part of all the these individual elder flowers was used for this elder flower vinegar, while the majority of the elder flowers are now turned into elder flower liqueur. I will share the recipe with you on this liqueur in the near future. 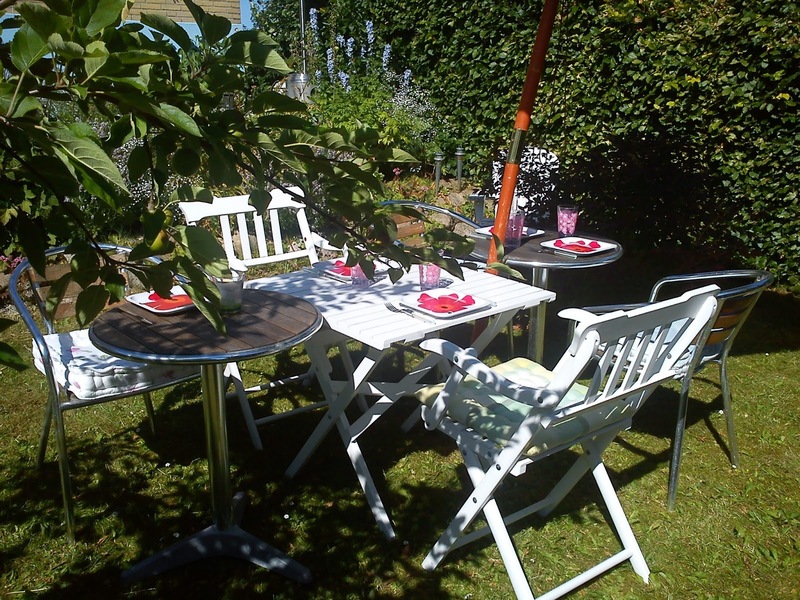 However, if you would like to work with elder flowers in your own kitchen, it is about time that you get yourself outside in the nature, as the elder flowers now are turning into the green elder berries, so you need to hurry up !!!! Remove the elder flowers from the stem. Fill the elder flowers into a clean glass. 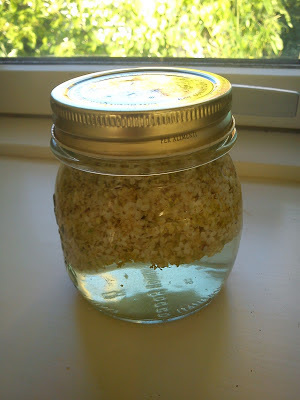 Fill up the glass with white vinegar. Place the glass in the refrigerator for some weeks, before the vinegar is ready. You can refill the glass with more vinegar as you use it. 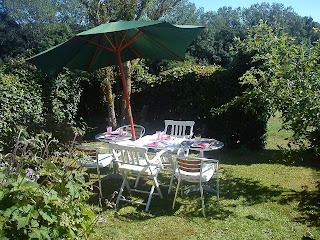 I try out this Aperol Spritzer on my friends in connection with an afternoon tea in garden. I am sharing the recipe as I made it, but a general agreement was, the drink was too bitter in the taste for us, so I would recommend, that you try sweet (sparkling) wine instead of the dry sparkling wine, which I used. 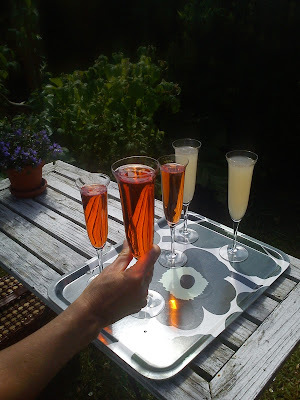 Start by filling the glass with Aperol followed by (sparkling) wine and finally a splash for sparkling water. Serve the drink as it is or garnish it with slice of orange. This is a dish, which does not require many ingredients, you only need ingredients, which you normally will have basic ingredients in kitchen as most of them are having a long shelf-life. I really am a big fan of risotto. Making risotto may require some cooking time in a busy daily life, but if you a bigger portion than needed, you can freeze the rest for those working days, where 10 minutes preparation time is maximum and still enjoy a home-made meal. 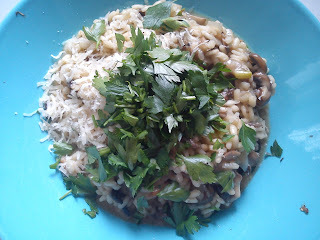 Serve the risotto with grated Parmesan and chopped parsley on the serving plates/bowls. 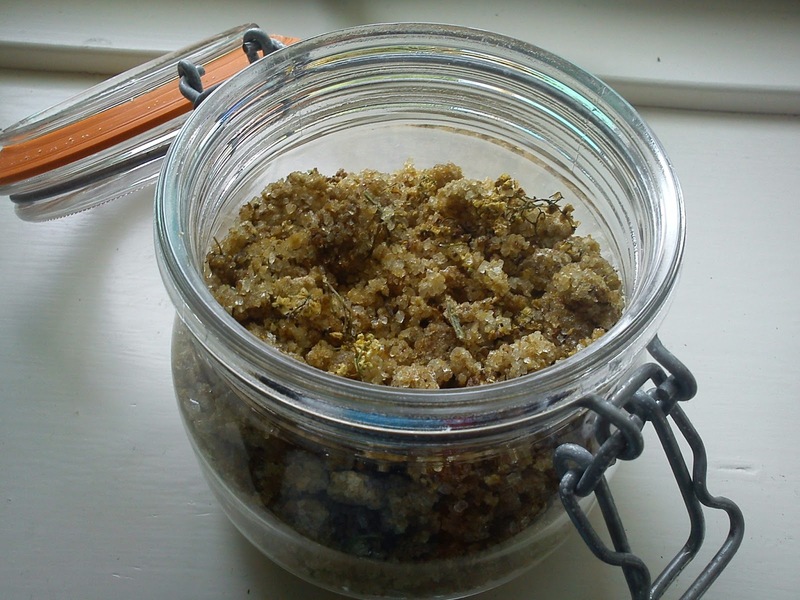 When I was making the elder flower salt I got inspiration to make this elder flower sugar. I imaging, that you can use this elder flower sugar as sprinkle sugar over fresh strawberries/fruit, creme brulee or ice cream. Only your imagination is the limit !!! Cut of the flower heads from the stems of flower flower. Fill sugar and elder flower into a food processor and blend everything into rough looking mass. Fill the elder flower sugar into tray/form. Cover the sugar with a clean tea towel. 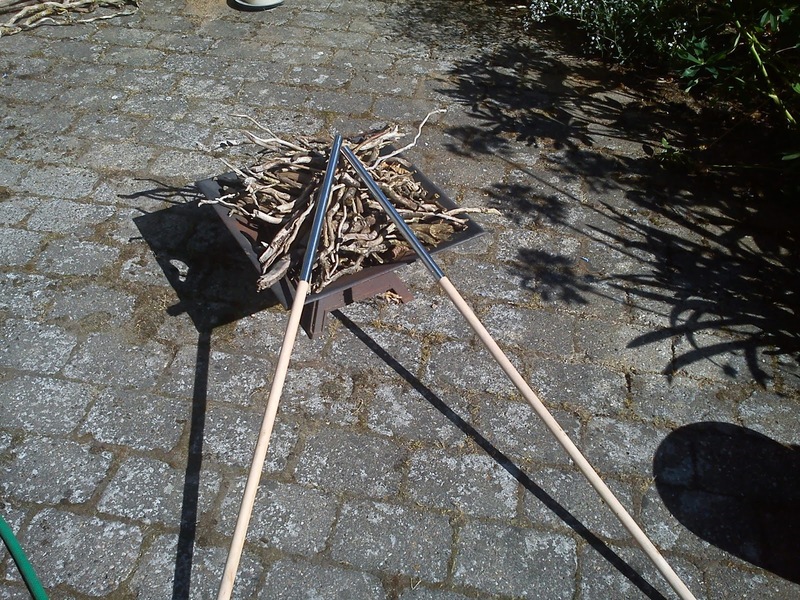 The drying process can take it´s time, something like 1-2 days. If possible you can dry the salt outside in the sunshine. When the elder flower sugar is dried, place it in air tight container.